Okay, so my goal isn't really to blunt your conscience. As marketers, we have an ethical responsibility to be honest and to avoid manipulation. But I'd like to explain how customers decide to buy in a slightly different way. Drivers are the things that supply the drive that moves people to action. Without some impetus, there is no action, because....well, why would there be? And guess what drivers are? They're emotions. Okay, so you want something, or want to avoid it. Now what? What action are you going to take? Obviously, it depends on what you want. you want it more than something mutually exclusive (eg. six-pack abs vs. no pain). you believe that you can get it. The factors that decide which way your drive pushes you are called Directors. Directors are primarily beliefs. Technically, the first thing in my list above, priorities or preferences, is a Driver -- an emotion -- not a Director. Once you decide which you want more, you still have to choose how to get it (or to try -- we don't always get what we're after). The third item is obviously about beliefs. But the second is about knowledge, right? Well, when it comes to determining whether or not you succeed, yes. But it's whether you believe that you know how to get it, or how you believe you can get it -- correct or not -- that determines the actions you'll take. Or whether you'll give up and not take any action. The actual knowledge is part of our third category. You can want something, and work your hardest to get it, but if you don't have the required capacity, no amount of desire or effort will get it for you. Anything that provides motivation sustains Drivers -- rewards, whether monetary, emotional, or whatever. Anything that strengthens belief sustains Directors -- feedback, encouragement, etc. Anything that enhances capacity sustains Empowerers -- training, resources, food, sleep, etc. So, what does this mean for ethical marketers? Yes, you need to lead with an emotion appeal. You've got to give your prospect a reason to want what you're offering. No amount of logic can provide a sufficient substitute for emotion. 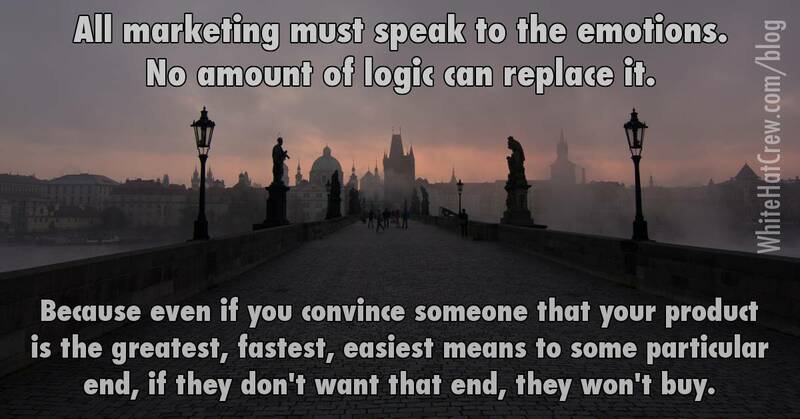 Because even if you can convince someone that you're product is the absolute best, fastest, easiest means to some particular end, if they don't want that end, they're not going to buy. And not only do you need to give them a reason to want the product, but you also need to, in your email subject line, give them a reason to want to open your email. At the top of the email body, you have to give them a reason to want to keep reading. And then to click through to your website. And then to keep reading your sales material. Eventually, either they'll want your product more than the money you're asking for, or they won't buy, no matter what logic you provide. You need to give them a reason to believe. This is where logic comes in. You show them why they should believe that your product will deliver what they want. Why they should trust you. Why they should be willing to take whatever risk is involved. That the risk is minimal, and the reward huge. You also need to empower them. You need to give them an order button that they can click to pay for the product. And you need to put it where they can find it. If it's an expensive product, you may need to give them a payment plan option. And you may need to sustain them. If you can convince them to subscribe to your email list, you can follow up with messages that show them more reasons to want your product, more reasons to believe that it will deliver results they desire, more knowledge to help them get maximum value from the product, etc. The key to the ethics of the entire process is that you never mislead. You don't claim that your product will deliver a benefit that it won't. You don't sneak hidden costs in after the initial purchase. You don't make it impossible to cancel a subscription. But there's nothing wrong with painting a crystal clear picture of how the benefit will feel to them. If you're honest and skillful in your marketing, then the people who will enjoy your product will desire it. They'll understand and trust that your product will deliver on your promises. Perhaps not all of them will be able to afford it. Or if using it requires skill or practice, maybe not everyone will be able to use it to it's full potential. Hey, you can't do everything for everyone. So, the question is, how do you present your product in a way that will appeal to the emotions of those who want what it offers? And how do you help them believe in it, and in you, enough to take action -- to make the purchase? That's what ethical marketing is all about.